﻿ On Saturday morning, I arrived at The Running Company for the Learn to Run clinic and found Greg and his staff wearing brightly coloured, obviously minimalist shoes. “What’s everyone wearing?” I asked. A Saucony shoe rep was at the store with bags full of demo shoes so the lads had laced up Kinvaras. “If I try a pair, can I run for a few miles in them?” I asked. I’d heard a lot about the shoe but, despite good reviews, I wasn’t sold. In fact, while I understand minimalist technology, I’m not personally sold on it; for me to invest in a such a shoe, I would have to spend a good chunk of time in them first – not just a few minutes while lacing them up in a store. Trying out a pair during the Learn to Run clinic seemed like the perfect opportunity. “Sure!” he agreed.. After all, he did have my shoes from a competitor to hold as insurance. As I was handed the ladies’ Kinvara 3s, I commented on how white they were, compared to other running shoes; I felt like a 6 year old putting on new sneakers for the first day at school. The light weight – 6.7 ounces – reinforced the childlike design of the shoe and, admittedly, that made me nervous. Blame it on being old-school, if you will, but I am comforted by having a few more ounces around my feet; I worried that something so light would result in tender tootsies. I had to change the first pair he gave me for a smaller size as the toe box is a bit wider than in other shoes. I also noticed the mesh-like fabric of the upper, FlexFilm™, which Saucony describes as “a strong yet pliable material innovation that adapts to your foot and provides a lightweight, seamless feel.” The longer I stood around in the Kinvara 3s, the more comfortable my feet became in them and the more confidence I gained in the shoe. When I took them out for a test-run, I felt that I had to adjust my gait over the first few kilometers to meet the design of the shoe. Typically, I am a mid-foot striker and that was emphasized by the design of the Kinvara 3’s; once I figured out exactly where I should be placing my foot when I landed, the shoe began to respond to me. While propelling me forward, they gave me both the comfort and support that I needed for fast and smooth ride. 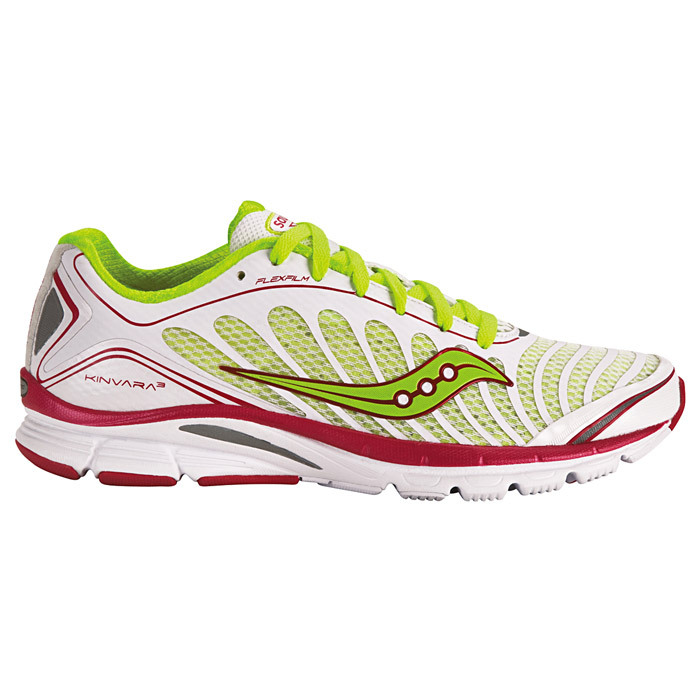 When I got back to The Running Company, I commented that I would love to wear the Kinvara 3s as a racing flat. I, then, learned how light the shoe really is – only an ounce more than a racing flat. Once skeptical about minimalist technology for myself, I’m now more open to it. I don’t think I would want to consistently train in them but I’d love to start with a pair for track and racing. Thanks, Saucony, for giving me the opportunity to take out the Kinvara 3s for a real spin.